"Toll City redefines warehousing solution options for its customers through leading-edge technology and innovation in a world-class facility. It is ready to increase Toll's productivity and meet warehousing capacity demand in a region that is set to become one of the largest economic blocs in the world." 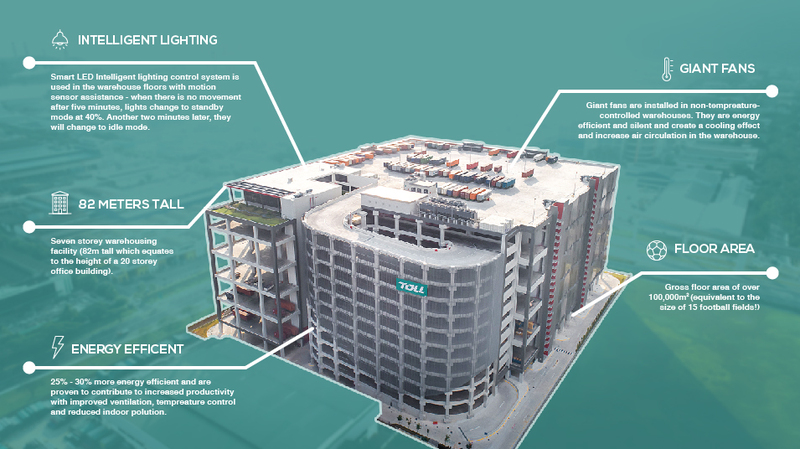 Toll City is more than a building — it is the future-ready gateway to Asia and the world. As an integrated local and regional hub, Toll City offers you the ability to move your goods with minimum on-ground transit time. The facility is situated less than 3km from the new Tuas Port in Singapore, making it the perfect central point for distribution throughout Asia. Toll City offers supply chain solutions to suit a number of business requirements and supports Toll’s key industries of retail, fast moving consumer goods (FMCG), healthcare and pharmaceuticals. Whether it is warehousing, transport or cross-border, Toll City has a specialised solution that can be tailored to suit the customer’s needs. Toll City is a tax-effective hub in a country that maintains a safe IP environment with generous rebates and concessions to attract emerging and dynamic companies. The establishment of Free Trade Agreements — Trans Pacific Partnership, Regional Comprehensive Economic Partnerships and the ASEAN Economic Community — will create a focused market for goods, services, capital and labour. With its ability to develop tax-effective supply chains, world-class sea ports and airfreight facilities, and its pioneering use of Intelligent Transport Systems (ITS), Toll City is a world leader in urban transportation and infrastructure. The facility has been designed to parallel Singapore’s economic strategy with greater emphasis on productivity, technology, security and automation for a better business future. Innovation plays a huge part in what makes Toll City so unique. We are able to continually improve our service offering through the use of the latest technology and implement it into our operations. Accommodating almost any configuration of technology to support current and future customers, Toll City is equipped to meet the region’s industry and economic demands. We have partnered with developers using the best in technology and systems to promote efficiency and transparency across the supply chain. SiTadeL Supply Chain Control Tower — The award winning broad spectrum IT platform functions as an information hub and decision support system. It provides end-to-end visibility of our business and facilitates data-driven decision making. Created in-house, Toll is able to control and add additional systems according to the customers’ requirements. Some key features include its risk resilience platform, freight management system, transport management system and native mobile applications. Smart cabinet for better storage and traceability — our smart cabinet is an advanced inventory management capability that allows for storage and added security of high-value goods, i.e. implants and medical-grade equipment, with the use of RFID readers. Real-time stock levels are fed to an online application that can be accessed off-site. The system creates an automated system for replenishment according to consumption. It triggers the warehouse once replenishment is needed and allows us to respond quickly and accurately to our customers’ needs. Automation for improved efficiency –Toll City has a host of innovative technologies that enable us to automate processes, improve efficiencies and create a seamless process for our customers. Automated Guided Vehicles (AGVs), or unmanned Materials Handling Equipment (MHEs), are used in Toll City to provide a safer and more efficient alternative to traditional MHEs. Along with the use of the Shuttle Orbiter System (SOS), a high density storage solution, we are able to store more goods on pallets in a space with lesser floor area as compared to a traditional racking system. Other systems like the Vertical Lift Module (VLM) and the automated pallet inverter were also implemented within Toll City. With the use of internet of things, Toll is able to remotely control systems and respond to situations faster and more efficiently, according to our customers’ requirements. Using innovative technology like this benefits both our customer and our business – Toll city is designed to accommodate industry-specific technologies and automation for safer, more secure and faster throughputs for increased productivity to support the demands in the region. At Toll we pride ourselves on being a value creation partner. Our customer journey begins with collaboration to truly understand your core business, so we can provide a fully customised, logistics solution according to the industry requirements. Covering more than one million square feet, Toll City is a seven storey warehousing facility (82m tall which equates to the height of a 20 storey office building) that has a gross floor area of over 100,000m², equivalent to the size of 15 football fields - making it one of the largest Toll sites in the world. Toll City has received a Gold Certification in Leadership in Energy and Environmental Design (LEED). This certification acknowledges Toll’s contribution to the environment and sustainability. LEED initiatives at Toll City reflect our core value of caring for future generations and include responsible choices about architectural components, types of paint and adhesives used, choices on cooling and ventilation and rainwater harvesting. LEED buildings are on average 25%–30% more energy efficient and are proven to contribute to increased productivity with improved ventilation, temperature control and reduced indoor pollution. We believe in leaving positive legacies in the communities in which we operate. For Toll City, we worked with our construction partner of choice to improve behavioural safety standards through ‘felt leadership’ principles, and assisted them in improving their risk management approaches for the benefit of those that work for them, and for the company itself. In the warehouse, we focus a lot on sustainability as well. For example, we have installed fans in non-temperature-controlled warehouses. They are energy efficient and silent and create a cooling effect and increase air circulation in the warehouse. This helps to create a more comfortable working environment for our workers, and they in turn are more productive and efficient. We are also using a smart LED Intelligent lighting control system - with motion sensor assistance. When there is movement, the lights will turn on. When there is no movement after five minutes, lights change to standby mode at 40%. Another two minutes later, they will change to idle mode. All these savings and improved productivity will ultimately benefit our customers as savings and improved efficiency are passed on. At Toll City, we are committed to attracting and retaining the best in the industry. With a current employee base of over 400, our highly trained, dedicated employees facilitate the seamless operation of your logistics business every day. Since its inception in 1888, Toll has grown from its single horse and cart operation in Australia to one of Asia Pacific’s leading logistics providers with a truly global footprint. In 2015 the group was acquired by Japan Post, making it the world’s fifth largest logistics company. Today Toll offers end–to-end integrated logistics solutions providing regional capability with global connectivity. Our consistent service delivery and financial stability has resulted in long partnerships with our customers and our ability to respond to demand volatility ensures we are a trusted partner. Safety is a core value at Toll. We believe everyone has the right to go home safely. It’s more than words on a page – we live it unashamedly, and we weave this value into everything we do with you, applying world-class safety rigour to our service solutions and customer operations. We are always looking to deliver cost efficiencies to our customers as well as speed to market solutions through the early adoption of technology and innovation to provide you with added value. In Singapore we have a dedicated innovation centre exploring cutting-edge technology such as robotics, integrated automation and communication as well as redefining older technologies such as RFID to ensure we are constantly evolving and responding to the demands of our customers and the market. But we know that you don’t expect us to rest on our laurels and that is why we operate a continuous improvement model designed to increase customer value. We deploy a world-class, lean-focussed Continuous Improvement program across our organisation that serves to enhance our customer value proposition. Our approach to customers is to proactively improve our customer communication and transparency through an embedded listen and respond culture. And drawing on the broader group, our economies of scale do not just extend to our cost advantages, but to our breadth of expertise across our network. We are constantly drawing on this logistics experience and combining it with in-country expertise to deliver successful solutions. Allowed types: pdf doc docx jpg png gif mp3 mp4 mov.